Unfortunatly, this was another version of Void that I was dissapointed with. Having just got my milling machine, my options of how I could build it suddenly expanded. I designed a quite complex chassis, which worked quite nicely, however the fundamental basics of the robot still gave me problems. Once again I had to downgrade from 3 to 2-cell lipos due to weight problems. 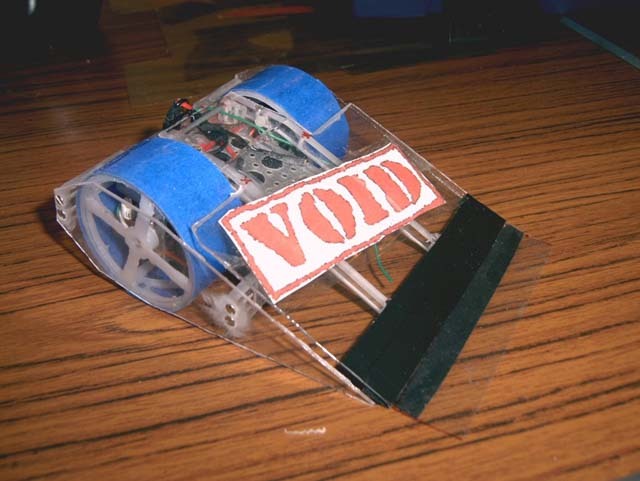 I also had multiple plans for the flipper to get it fast and powerful, however, unfortunatly, none of them worked, so I ended up with a standard S136l (running on 7.4v) which was very slow and ponderous. Overall this version wasn't awful, but again, it wasn't great either. As the competition and my own knowledge has advanced, Void's long shape just isn't that effective anymore, so I'll be changing that aswell in the next version. The only good thing with this version was that I replaced the horrible s136l boards with proper Scorpion Mini's, which I must say are excellent.